Implementing legislation is outlined, followed by commentary by Ms. Boehm, who suggests that those who are opposed to the bill be asked to model legislation that might answer their concerns. 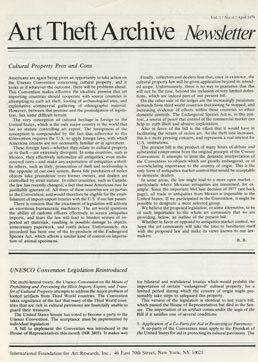 Canada's Cultural Property Act, passed September 1977, establishes a control list of specific works and categories of objects whose export requires a permit. A First Report on the first six months of the Act has been published. Paris art dealer Paul Petrides, author of the catalogue raisonné on Utrillo, is convicted of dealing in stolen paintings. This protracted case started in 1973. Patty McClain and other dealers, arrested in 1975 for possession of smuggled pre-Columbian ceramics, had their convictions reversed on appeal but were re-tried and re-convicted in 1977. Their appeal has just been decided: the theft conviction reversed but the conspiracy charges upheld.